What a day! 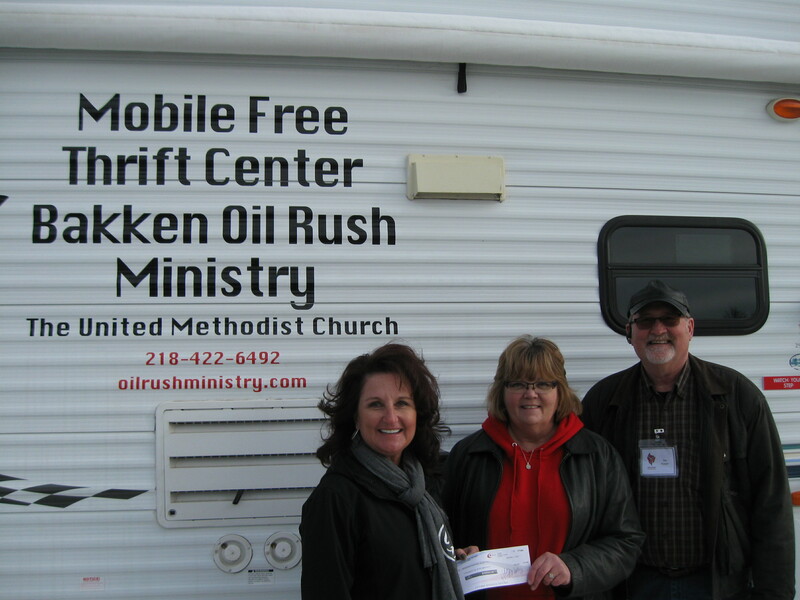 Pictured is Brenda from McKenzie County Electric making a $400 donation to our mission in Watford City. She had heard that we were doing “good things” to help the less fortunate in the Watford City area. (Thank you Stacy) She met us at the thrift center where we were set up this afternoon in conjunction with the food pantry. We were the busiest we have ever been. We also were able to give gifts to children of needy families through a partnership with a group called, Women of the Bakken, who donated gifts to help make this a Merrier Christmas. What we have found interesting is how we just “happen” to have what people are looking for. We had a man looking for insulated coveralls and Kathie was sure we had no more left. She decided to take another look and found a pair that had fallen off of the back of the basket we stored them in. It “just happened” to be the right size and he was thrilled to death to have them. And we were reminded again how God cares for each one and their needs. There are numerous stories like this that “happen” each time we set up. Thank God for being present in what we’re doing and for all of you who have donated items that we have been able to pass on to these people. We are blessed to help and they are blessed, being helped.